Last week, Jaime and I had the BEST time in Atlanta! We flew out there for some meetings and to hang with some of our favorite Atlanta-area bloggers. Really, we were most excited to have the chance to wear SWEATERS! Truth be told, there were moments that weren’t as cool as we would like, but in the morning and evenings, there was a definite chill in the air and we were psyched to take full advantage. 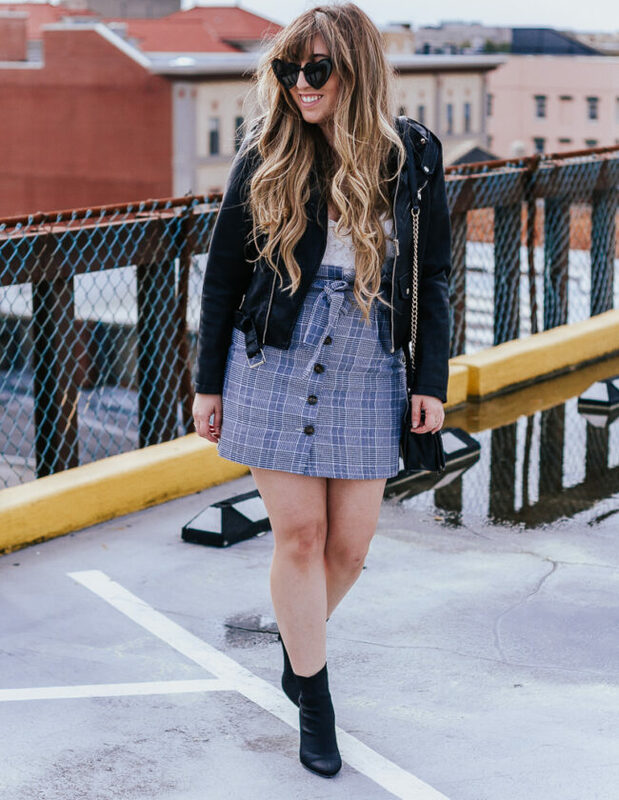 Running around town, I wanted to be comfortable but still stylish, which to me always means an easy dress and booties. For fall, that means a cozy sweaterdress. I spotted this pretty under $100 sweaterdress in-store and fell in love with the sleeves and the mauve color. I was initially worried that this would be wildly unflattering, but I think the trick is length and styling. First off, the sleeves. I love the voluminous lantern sleeve, but pushing them up my forearm definitely looked more flattering. If you feel iffy about the loose style, I’d definitely recommend belting to create a waistline. This will also help if you’re on the shorter side… because length is going to be important to making you look skinnier. You should definitely be able to see your knees! 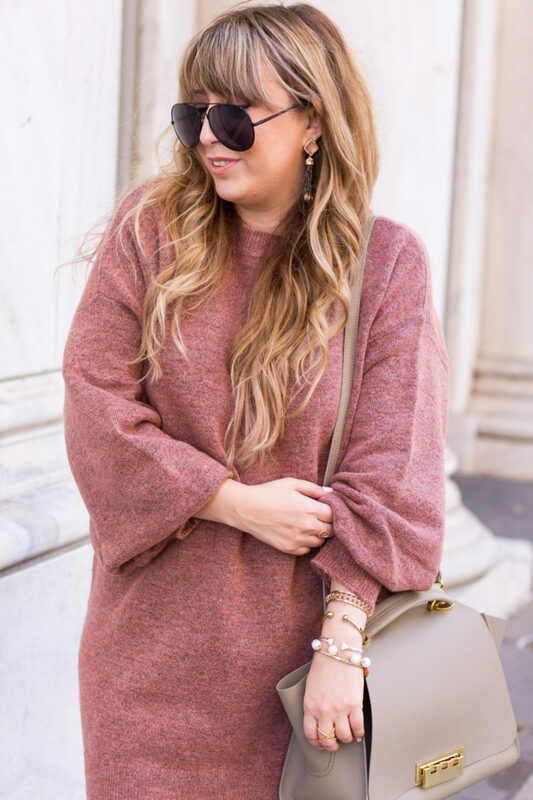 I think the most important thing when styling an oversized sweaterdress is proportion and accessories. Try to dress up the rest of your look so that you look more polished. 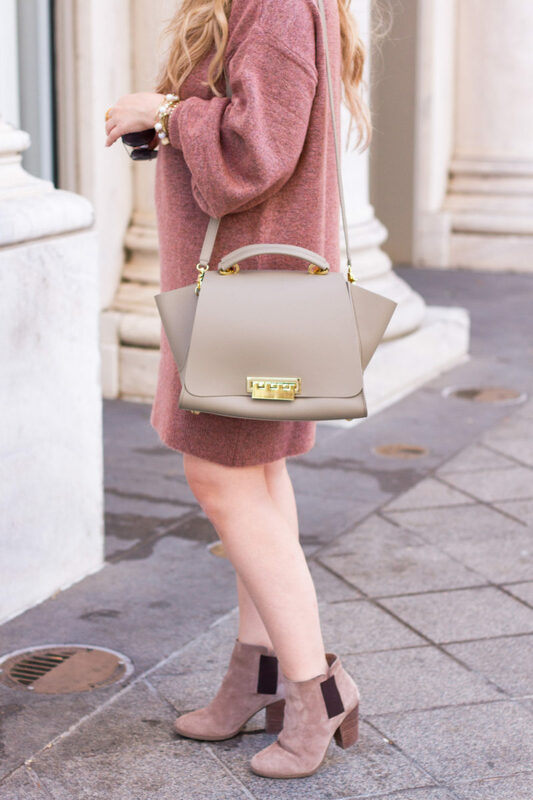 This Zac Posen bag is so gorgeous isn’t it? (I snatched it from Jaime haha!) It’s super soft and such a glamorous polished piece. It was the perfect finishing touch to the look, along with these Kendra Scott rose gold tassel earrings that have basically been burning a hole in my jewelry box, I’ve been so excited to wear them.